Tomorrow is our son’s first birthday party, and my wife and I (mostly my wife) have been busy with the party arrangements. Food has to be prepared and/or purchased, cupcakes need to be baked and decorated, and it seems like a hundred other things have to be done as well. On the one hand, I can’t help but think how the traditional 1st birthday party is kind of overdone. The birthday boy doesn’t even know how to say the word “birthday” let alone comprehend its meaning. In the grand scheme of things, Tyler isn’t going to remember this birthday. On the other hand, I know that this party is as much for my wife and me as it is for Tyler. Looking back, it’s hard to believe it’s already been a year. It is definitely something worth celebrating. Now, this post wouldn’t be complete with at least a little bit of personal finance mixed in. So let’s discuss how to put on a good first birthday party without breaking the bank. 1. Avoid party stores and pre-made party supplies. Have you looked at the price of birthday party supplies at the store recently? First of all, if you already have a theme in mind it can be difficult to find what you want at the store. Second, themed party supplies at the store are expensive. 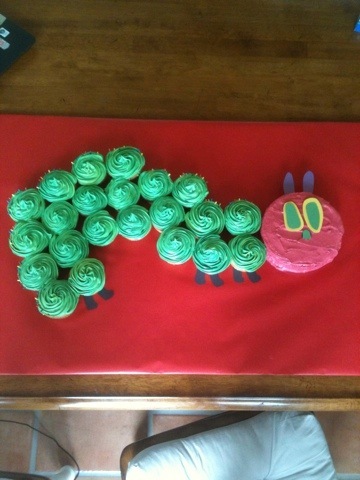 We wanted to have a “Very Hungry Caterpillar” party since that is his favorite book. Stores simply don’t carry party supplies with that theme, and party supplies online were outrageously priced. But if you do a google search you can find hundreds of do-it-yourself party ideas that are very inexpensive. So I designed invitations on the computer and printed them myself. We printed some neat decorations and found lots of neat ideas, including how to make a caterpillar out of cupcakes. 2. Buy paper and plastic products at dollar stores. We’ve found that our area dollar store is the place to go for colored table clothes, napkins, plates, utensils, etc. The same items at Hobby Lobby or Michael’s always cost at least two or three times as much. 3. Work with friends and family to prepare the food. This is another thing where it pays to go the do-it-yourself route. Buying an already-made meat or veggie tray at the grocery store is quite expensive. It costs a lot less to buy the individual items and do the arranging by yourself. I understand that this would be a lot for one person to do alone, so ask friends and family to help out. 4. Keep in mind the purpose of the party. Too many people obsess over party details and try to make everything absolutely perfect. But the point of the party isn’t about the detail of your decorations or the way the cake looks. It’s about family and friends getting together to celebrate a special occasion. This morning we made our caterpillar cake, and are quite pleased with how it turned out. I thought I’d share a picture. Do you have any party planning tips? Share your story in the comments section below. 1. Grab a piece of paper and pencil. 3. Write down whatever comes to mind. 4. When the moment feels right, stop. I know that personally, the single biggest factor in getting me to remember what’s important was having a child. From that point on, life was no longer about me or even me and Amanda. We were now completely responsible for another living, breathing person. His needs have to be met, regardless of what Amanda or I have planned or would rather be doing. It really makes us stop and think, “What were we doing with all our time before he arrived?” I can’t think of anything that we no longer do that I truly, deeply miss. We still have our time in the evenings when Tyler is asleep to talk and just spend some quality time together. It’s true that now we have less time for that, but we’re aware of that and make sure to enjoy the time we do have. Not that there aren’t areas that I’d like to improve on. I know I can be a better husband, and I need to work on that. I’d like to do more community-service related activities, and I need to work on that. I know I can manage my time better and get important things done, and I need to work on that. Take some time and read Josh’s post and complete the exercise he mentions. We only get one life. We need to make the most of it. What Does Being Frugal Mean? Much like the word “budget,” the word “frugal” and all its forms seems to have a negative connotation for many people. Much like using a budget, being frugal forces people into making choices with their time and money that they’d rather not have to make. Being frugal means you think twice about it before eating out, buying that newest gadget, or buying that new car. However, it doesn’t necessarily mean that you can’t do any of those things. If your finances are in order and those are things you really value and truly bring happiness to your life, then go for it. Being frugal is more about the thought process behind your purchases. The tendency to acquire goods and services in a restrained manner, and resourceful use of already owned economic goods and services, to achieve a longer term goal. The part of that definition I like most is that the purpose of being frugal is to achieve a longer term goal. It’s about doing what is really important to you. I’ve read quite a few posts about something called “intentional spending” that is very similar. Our spending paints a picture of what our life’s priorities are. For example, in our family the largest monthly expense is for housing, which is obviously very important. Following that, the next two things are groceries and baby, also very important. And number three is savings for retirement, very important to us as well. For us, entertainment and eating out are probably close to the bottom of our list. Spending on our dog is a lot higher. Cell phone and Internet use is somewhere in the middle. It’s a neat exercise to go through, and It doesn’t take very long if you’re already keeping track of your expenses. If you’re spending more on your monthly cable bill than you’re putting away for retirement, one way of looking at it is that your daily television watching is more important than your future living conditions. That may be a bitter pill to swallow, but it makes sense. I understand that those just starting their financial journey will see some scary things with this exercise. Your largest expense could very well be interest on your debt. Now I’m not saying that interest is the most important thing to you, though the education/vehicle/purchasing that created the debt was obviously pretty important to you. But whatever the amount of interest is, paying off those debts is pretty important. Once those are gone you can put your money to work on other things; things you may not be able to spend much on now. The point is to really think about your spending choices because they reflect what is most important to you. I’m not saying to stop and think over every item at the grocery store before putting it in your cart (that would be major overkill and take hours). Just be conscious of where your money is going.